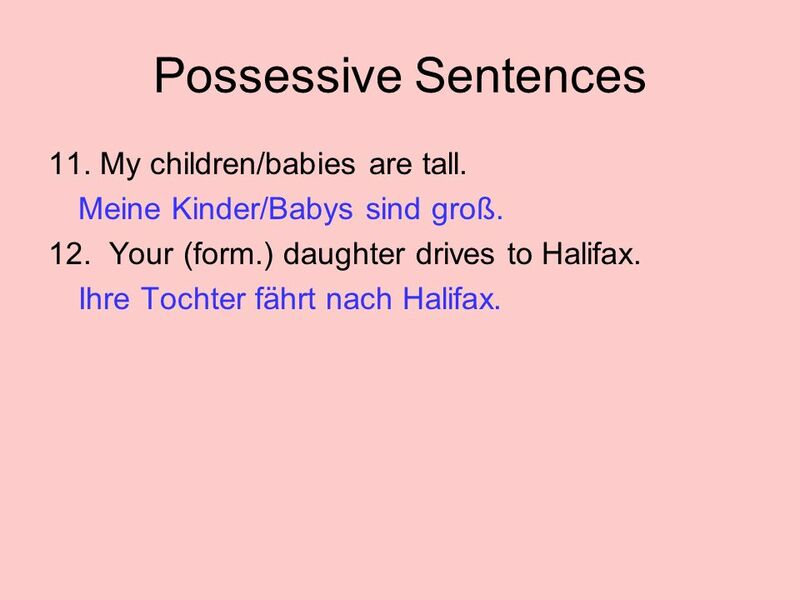 Possessive Sentences 1. It‘s (the baby‘s) ball is red. Sein Ball ist rot. 2. Your (sing.inf.) books are old. Deine Bücher sind alt. 3. His class begins. 1 Possessive Sentences 1. It‘s (the baby‘s) ball is red. Sein Ball ist rot. 2. Your (sing.inf.) books are old. Deine Bücher sind alt. 3. His class begins at 8:45 A.M. Seine Klasse beginnt um Viertel vor neun am Morgen. 4. We drink our beer in the evening. Wir trinken unser Bier am Abend. 5. Where is her secretary? Wo ist ihre Sekretärin? 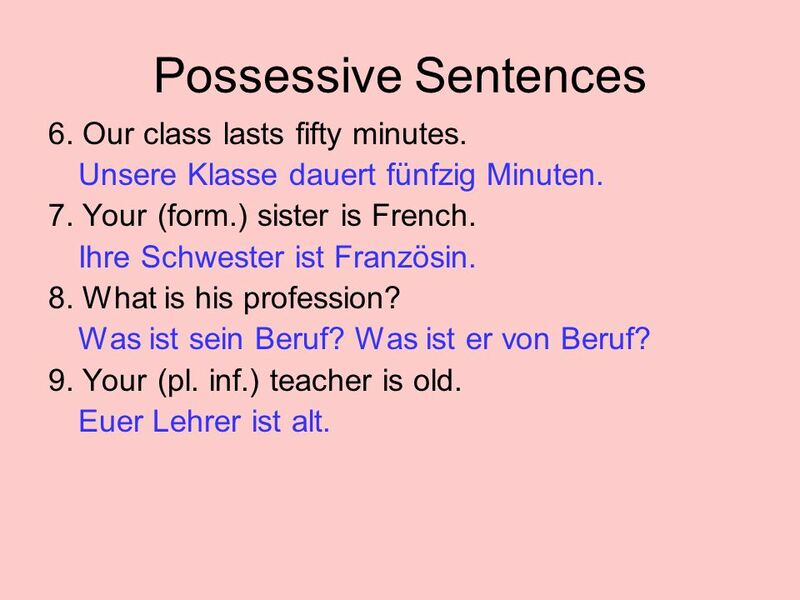 2 Possessive Sentences 6. Our class lasts fifty minutes. Unsere Klasse dauert fünfzig Minuten. 7. Your (form.) sister is French. Ihre Schwester ist Französin. 8. What is his profession? Was ist sein Beruf? Was ist er von Beruf? 9. Your (pl. inf.) teacher is old. Euer Lehrer ist alt. 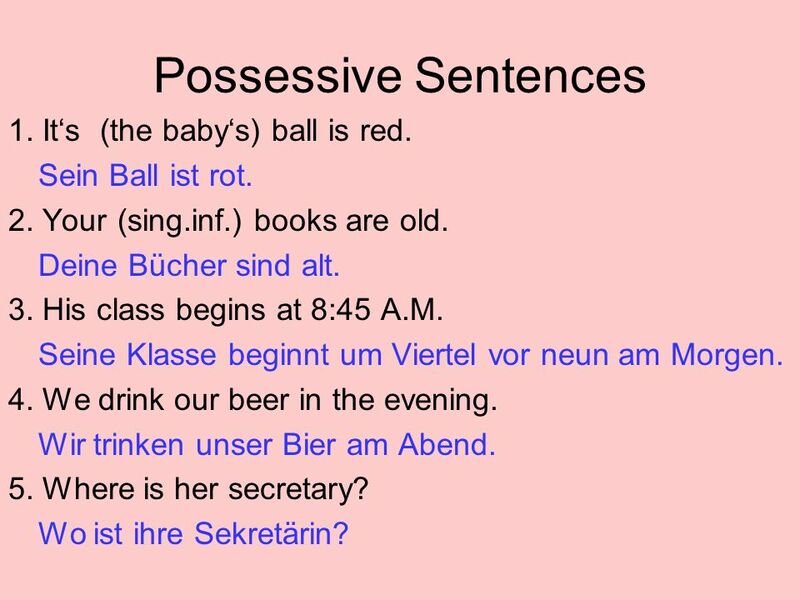 3 Possessive Sentences 11. My children/babies are tall. Meine Kinder/Babys sind groß. 12. Your (form.) daughter drives to Halifax. Ihre Tochter fährt nach Halifax. Herunterladen ppt "Possessive Sentences 1. It‘s (the baby‘s) ball is red. Sein Ball ist rot. 2. Your (sing.inf.) books are old. Deine Bücher sind alt. 3. His class begins." As you have already learned, GENDER plays an important role in the German language. As you have already learned, GENDER plays an important role in the.